Stormwater is runoff from rain or snow that can’t be absorbed through surfaces like driveways, parking lots, roads, sidewalks or roofs. As water travels over these surfaces, it may pick up dirt, trash, oil, grease, pesticides, fertilizers, pet waste and other pollutants, carrying them into Richmond’s waterways. Managing stormwater runoff is the best way to decrease the amount of pollutants in our water. 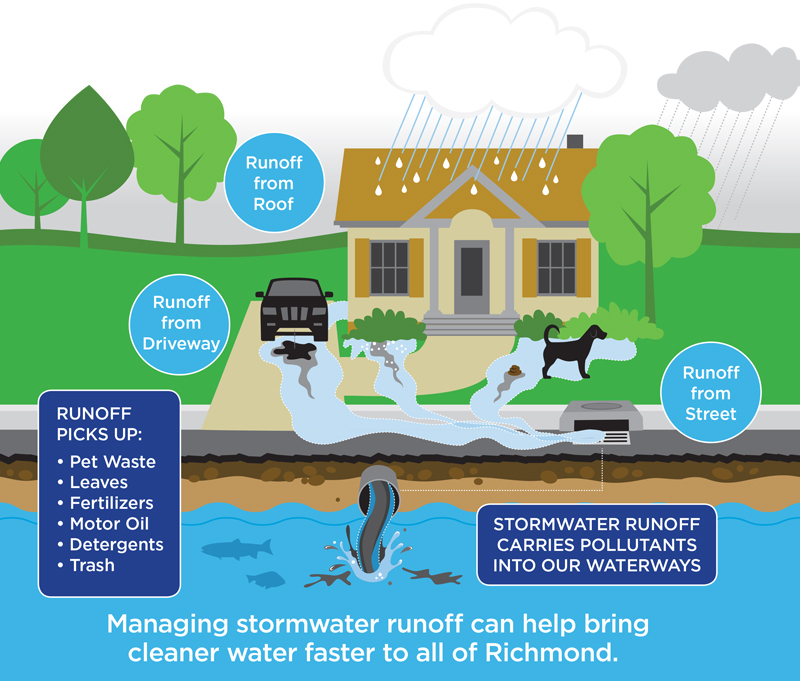 Outreach programs by DPU help community groups and Richmond Public School students understand stormwater runoff and their role as caretakers of our water and environment. There are things you can do right now to help reduce stormwater pollution, and it begins right in your own home! Visit our Pollution Solution page to see some of the ways you can help prevent stormwater pollution.